"WE PICKED UP WHERE MILWAUKEE LEFT OFF"
You felt that twitch or what you thought was a low tire before. The Dealer replied, "Never heard of that problem before". BULL! Little did I know what my Sunday afternoon ride had in store for me. Cruising through the absolutely beautiful forest with gentle curves was ecstasy. Sunlight shafts were breaking through the trees and the smell of the pines, wow. I get goose bumps thinking about it. I was really into it. So, I grabbed a handful and setup for the next sweeper, leaned it over a few degrees, rolled on the throttle and accelerated through until all HELL BROKE LOOSE. The rear wheel started to weave then wobble and actually steer the bike in a different direction than the front! The back of the bike started heading for the guardrail. I tried to correct with body English and push the handle bar to pull out of the inevitable. The back of the bike slid sideways first.The right saddlebag banged hard against the guard rail at about 60-65 miles per hour. Fortunately I didn't go down, but managed to turn into the guard rail and scrape off some speed until I straightened out. It scared the sh*t out of me, I had to use Handy Wipes later and clean up. NO MAS! NO MAS! To make a long story short I came up with a solution that cured the "REARSTEER™", when the swing arm pivot mounts compress or move. A caged bracket that attaches to the bottom of a Dresser or Road King oil pan transmission (1993-present), which mounts an isolated stabilizer link connected to a frame bracket. The rear tire now follows the front without changing direction. I call the device "TRUE-TRACK™" (PATENTED). It keeps the swing arm pivot anchored in position and therefore stable. I also designed models for the older rubber mounted Harleys 1980-1992 as well. You'll find 'em all at the Product Page -check it out!!! Oh, I forgot to mention. My contact with the guard rail cost me $2100.00 a new front fender, right fork leg (chrome gouged) replacement, new fairing cap, right floor board, scratched right tank, scrapes on the right bag, hardware and repaint. Now that does not include the trick $400.00 shocks I installed before to try and eliminate the wobbling at the rear. "TRUE-TRACK™" is simply cheap insurance for the inevitable! 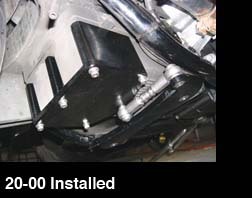 The "TRUE-TRACK™" (PATENTED) kit consists of four mounting brackets, CNC machined from an 11 pound solid block of "BALLISTIC BILLET™" aluminum, adjustable stabilizer link, all stainless steel mounting hardware and installation instructions . . . available and always in stock! WHY DOES MY HARLEY-DAVIDSON® RUBBER MOUNTED MOTORCYCLE WEAVE, WOBBLE and REARSTEER™? Harley-Davidson®, however, manufactures the Dyna with 1 stabilizer link, the FXR with 2 stabilizer links, the Touring Models (baggers) - 2 stabilizer links and the V-ROD with 1 stabilizer link CONTRARY TO THEIR PATENT. 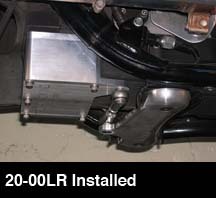 Only the BUELL and 2004 and later rubber mount Sportsters have 3 STABILIZER LINKS! a suspension stabilization device, acts to mitigate instability on vibration isolated motorcycles manufactured with LESS THAN 3 STABILIZER LINKS!